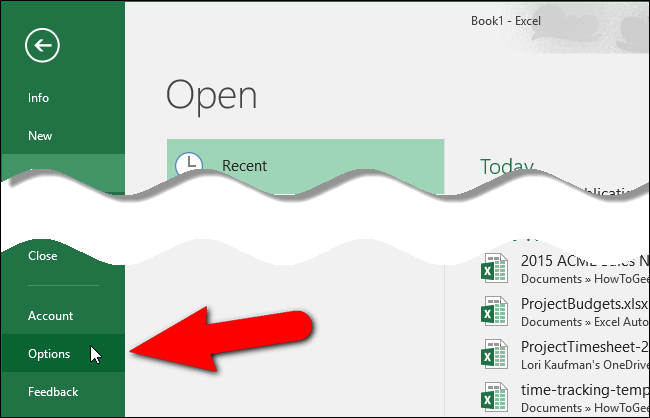 By default, when you type information into Excel and then press “Enter”, Excel will move the selection box one cell down. However, what if you want to enter information from left to right instead? We’ll show you a simple setting in Excel you can change that will solve your problem. To change the direction the selection moves when you press “Enter”, click the “File” tab. The “Excel Options” dialog box displays. Click “Advanced” in the list of items on the left. In the “Editing options” section, make sure the “After pressing Enter, move selection” check box is selected. Then, select an option from the “Direction” drop-down list. For example, we chose “Right” to make the selection go from the “Price (Dollars)” column to the “Price (Euros)” column in the price sheet pictured at the beginning of this article. If you don’t want the selection to change when you press “Enter”, turn off (deselect) the “After pressing Enter, move selection” check box. The currently selected cell will stay selected when you press “Enter”.